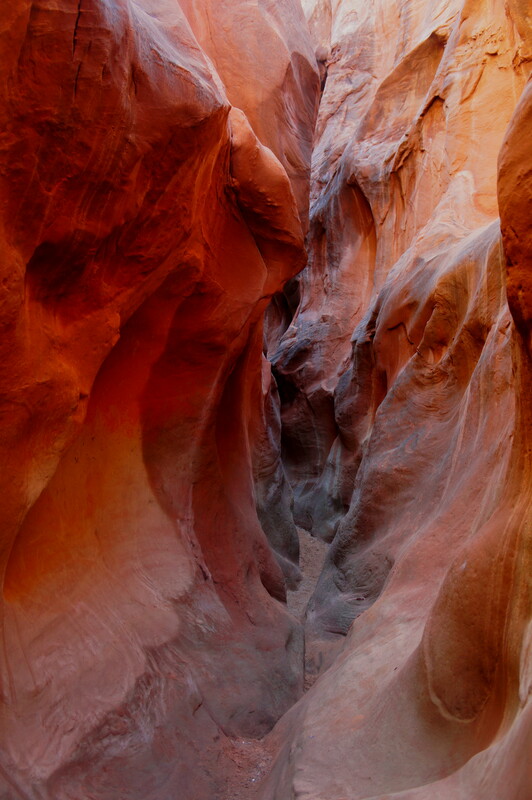 Though just a short walk from Peekaboo, Spooky, and Brimstone Gulch in Utah’s Grand-Staircase Escalante National Monument, the Dry Fork Narrows are often overlooked. 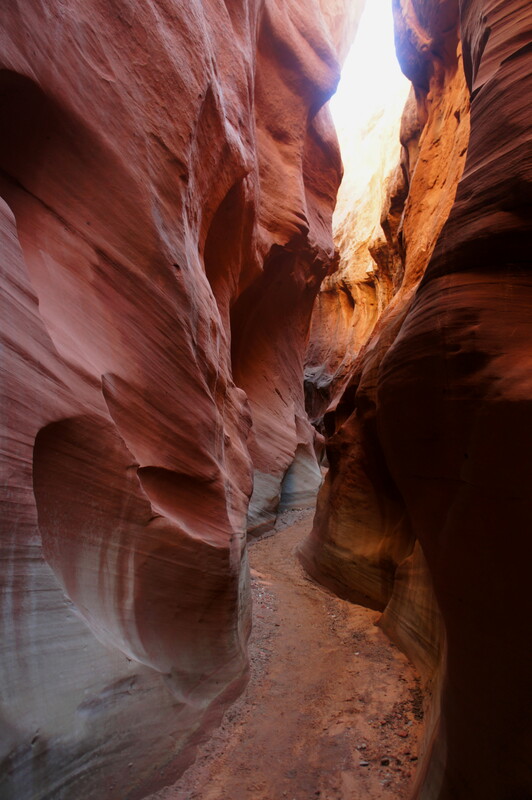 Situated at the base of the steep descent from the Dry Fork Trailhead, however, this ½-mile slot canyon is both easily accessible and easily navigable. 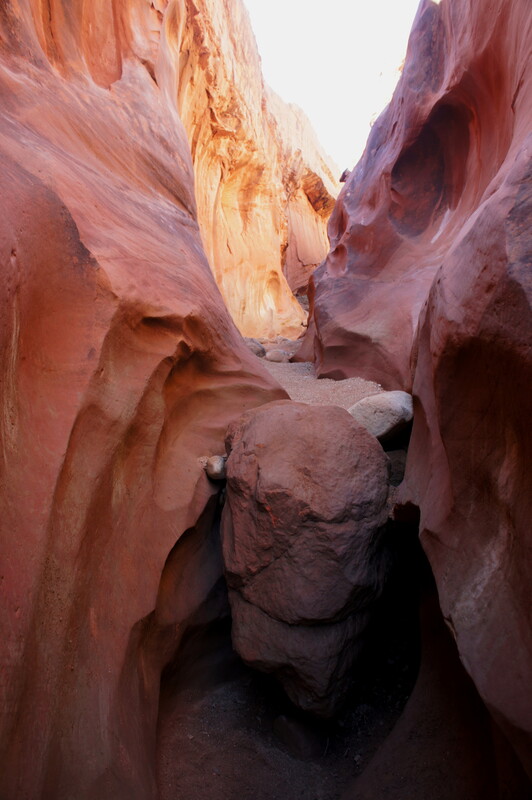 Unlike its nearby cousins, the narrows of the main drainage—Dry Fork of Coyote Gulch—are free of any serious obstacles. 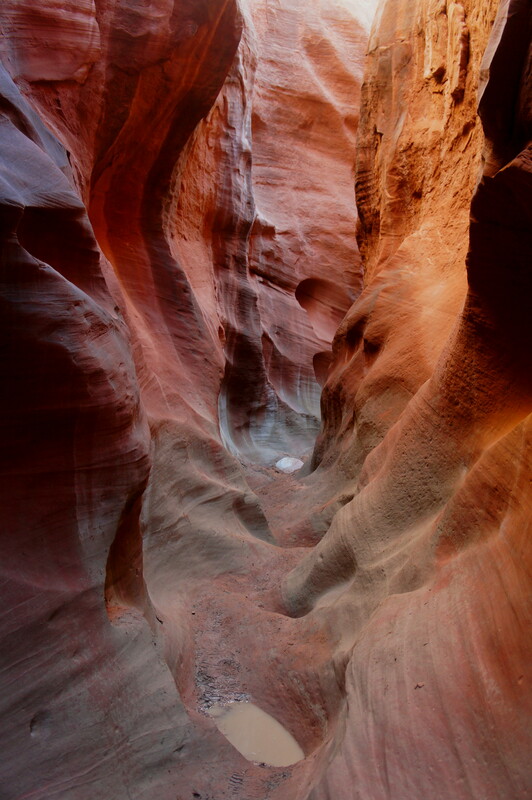 While not necessarily a major attraction unto itself, this slot canyon deserves a visit before—or after—the strenuous journey through Peekaboo and Spooky. Think of it as a warm-up, or appetizer, before moving onto the main course. Like Peekaboo and Spooky, the Dry Fork Narrows (sometimes referred to as “Eerie slot”) are accessed from the Dry Fork Trailhead. To get here, drive 26 miles down the bumpy, graveled Hole-in-the-Rock Road. (Note: check here for road updates.) Bear left at the sign for Dry Fork. Four wheel-drive or two wheel-drive vehicles with high clearance will usually be able to make it the additional 1.6 miles to the trailhead; all other vehicles should park in a well-worn clearing on the right around 7/10 mile up the Dry Fork access road (and walk the remainder). From the Dry Fork Trailhead, it is possible to peer down into the enticing canyon to the north—this is the Dry Fork of Coyote Gulch. Beyond the trail register (sign in here! ), a sandy footpath drops into the valley before disappearing into a sequence of sandstone benches. Follow cairns as you switchback down the cliff side. After 200 feet in elevation loss, the steep approach route drops into a sandy ravine bounded on one side by a wall of Navajo sandstone. A minute later, this side drainage merges with the much wider Dry Fork. 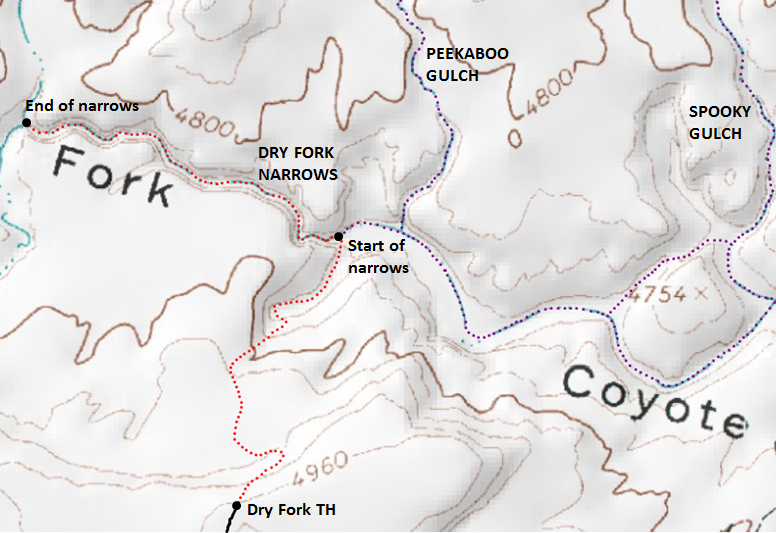 Here the Dry Fork remains relatively wide and open, but the Dry Fork Narrows are visible immediately on the left. At the slot’s entrance, the walls suddenly constrict to as little as 4-5 feet apart. The darkening chasm reveals a flood of colors: orange, pink, peach, gray, and violet. The first 2/10 mile of walking is flat and sandy, while the walls rise to 50-70 feet. Ubiquitous streaks or ripples in the rock serve as a reminder that the land of central Utah was once a vast desert covered in growing and receding sand dunes. 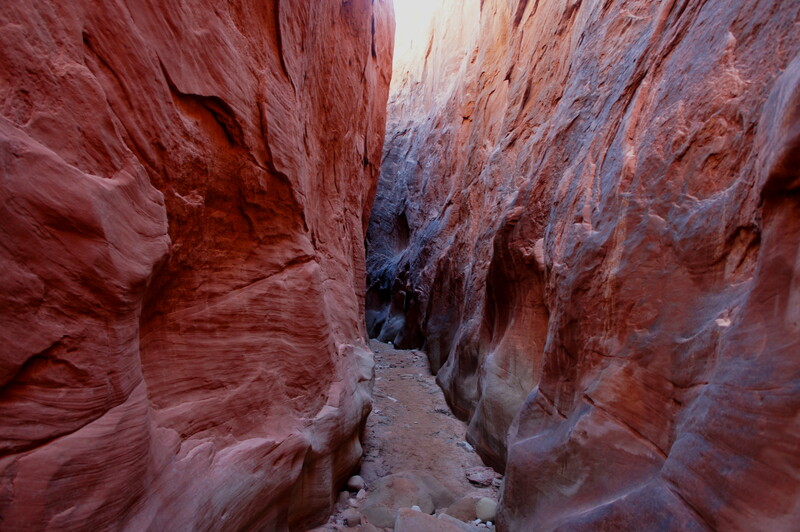 After five minutes, the canyon compresses further, and minor boulders litter the bottom of the slot. The thinnest, deepest, and most dramatic section—where slickrock actually forms the base of the canyon—is reached in about 7-10 minutes of leisurely hiking. The second half of the ½ mile narrows is relatively shallow—the walls rise to a mere 30-40 feet—but contains a couple minor obstructions. As of March 2015, the slot included two dryfalls (both near the end) and two small chockstones. Only the 4-foot chockstone near the middle offers a brief fight. Most will turn around at or near the confluence of a side drainage coming in from the north. Here the Dry Fork has opened again to the full sunlight. Turn around and return the way you came. From the entrance to the Dry Fork Narrows, continue on to the main attractions of the area—the Peekaboo and Spooky canyons—or to Brimstone Gulch, the farthest (but the darkest, deepest, and most mysterious) of the four slots. Return to the Dry Fork Trailhead after a fulfilling day in paradise. 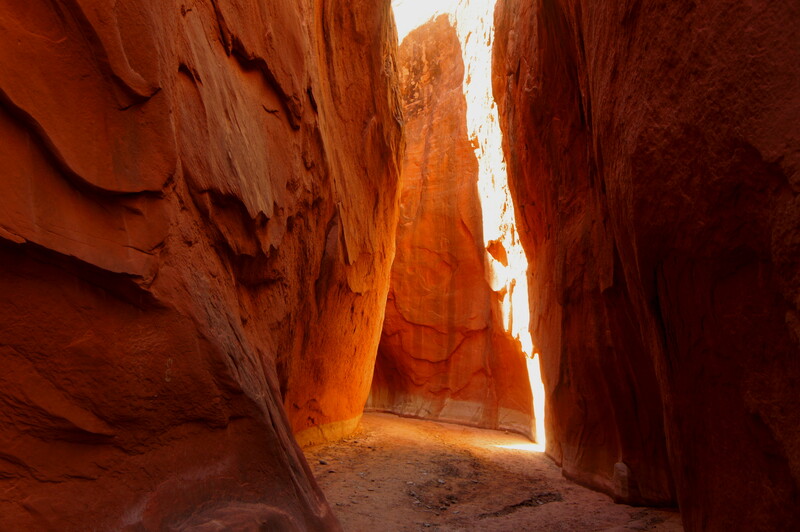 This entry was posted in Grand Staircase-Escalante National Monument, Moderate Hikes, Utah and tagged canyon, Dry Fork Narrows, Dry Fork of Coyote Gulch, Dry Fork Trailhead, Escalante, Grand Staircase-Escalante, Hole-in-the-Rock Road, Narrows, Navajo sandstone, Peekaboo and Spooky, slot, Utah. Bookmark the permalink. Next year, for sure, we will come back to this area. I need to do these slots!! Excellent photos and directions! We hiked into Dry Fork on June 13th, 2017. While the Hole-in-the-Rock Road and the 253 Road are no problem for 2WD vehicles, the last leg, on 252, requires higher clearance, especially near the trail head as the road climbs slightly. We met a baby rattler in a few hundred yards into Dry Fork, but otherwise had an uneventful but lovely hike surrounded by Navaho Sandstone which the pictures above represent well. Thanks Les! Really an incredible area.